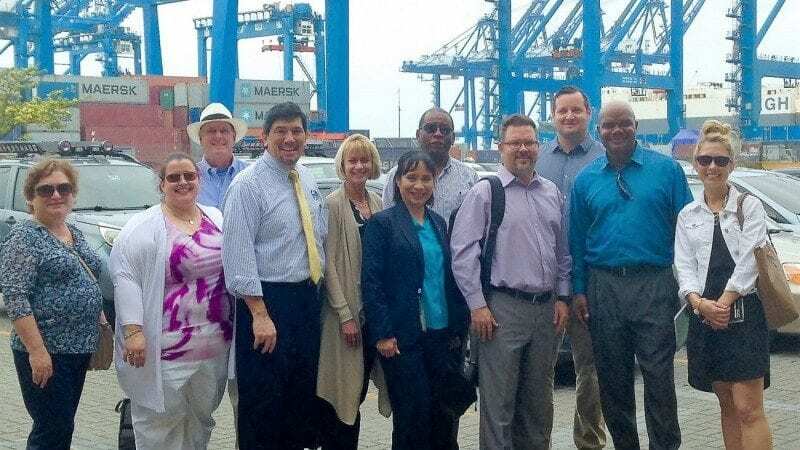 Polk State Bachelor of Applied Science in Supervision and Management students, employees, and representatives from the Central Florida Development Council visited Manzanillo International Terminal on Tuesday. It was one of several carefully selected visits made to complement their coursework back home and expose them to international business. Polk State Business Professor Herb Nold describes this trip to Panama as an academic/trade mission — and for good reason. Nold is leading a group of three Bachelor of Applied Science in Supervision and Management students during their stay abroad, but they are also accompanied by Central Florida Development Council Vice President Sean Malott and Senior Project Manager Spiros Balntas, as well as Madrid Engineering Group President Larry Madrid. Nold had long wanted to create trips like this one, which mix students aspiring to enter the world of business with current business leaders, and as the College began building its program in Panama, he finally had his opportunity. During their stay in Panama City, Nold, his students, and the representatives from the CFDC have maintained an aggressive schedule that has included visits with area businesses, including Esri Panama, a builder of ArcGIS software, the American-Panamanian Chamber of Commerce, the Ministry of Economics and Finance, Manzanillo International Terminal, and the Colon Free Zone, the world’s second-largest duty-free trade area. Each of the planned visits were carefully selected to complement what Nold’s students had learned in class. There have also been unplanned opportunities during the trip, including a visit to the City of Knowledge’s Innovation Center, a nonprofit business accelerator, and a meeting with William Lewis, an attorney and assistant director of the Colon Chamber of Commerce. Madrid and student Torrey Muhammad, who owns an air conditioning business, are both interested in expanding their businesses to Panama. They set a follow-up meetfdeing with the Innovation Center to discuss potential opportunities, and used Tuesday’s lunch with Lewis to get an introduction to Panamanian business practices and law. 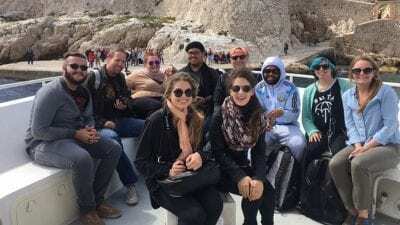 Watching from a few seats down at that lunch, as his student sat side-by-side with Madrid and discussed international expansion with a Panamanian attorney, Nold said this experience was exactly what he hoped his students would gain from the trip. “We’re putting the same things we talked about in class into actual practice. By having (Malott, Balntas and Madrid) here, the students are learning from their examples. They’re observing and seeing how they should act and respond in business dealings. It’s giving them a forum to practice and develop their presentation skills,” Nold said. This trip, the first of its kind for Polk State’s Business Program, also gets to the very essence of the College’s mission to provide a highly qualified workforce for Polk County employers. The CFDC is in Panama to explore opportunities for businesses back home, and Polk State is right by its side, absorbing the same information and identifying ways it can help Polk County businesses create the workforce they need to seize on those opportunities. Nold said he hopes to build on the success of the Panamanian mission by arranging similar trips that incorporate students, business leaders, and members of local economic development agencies. Who knows, he added, maybe one day he’ll be bringing students to Panama to visit Muhammad’s Panamanian operation.